Met Gala Reflects What's Trending... Everything! 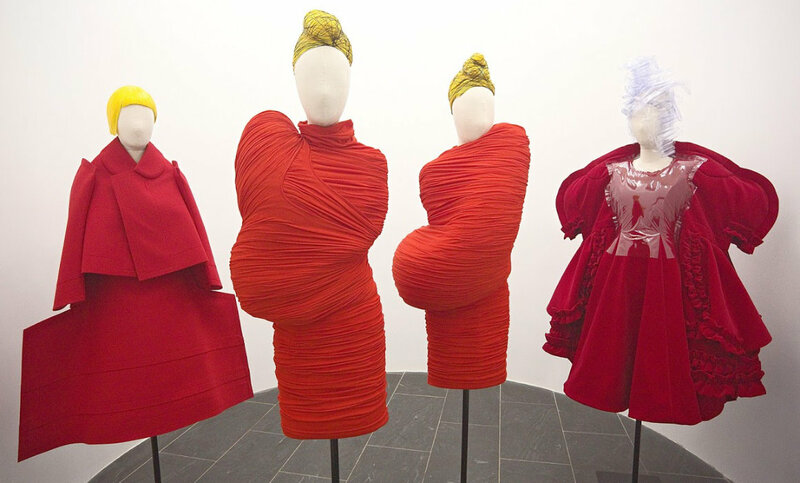 “Art of the In-Between” is the year’s big exhibition at New York’s Metropolitan Museum that pays homage to designer Rei Kawakubo of Comme des Garcons. That title is rather obscure, but maybe that’s the point. Only the second living designer to be so honored, the first was Yves Saint Laurent in 1983. The opening of the current exhibition was celebrated by the highly hyped annual gala party, once an elegant soiree, but now so celebrated that it has come to be a circus of sorts, upstaging the exhibition. The arrival of the attending celebrities from the worlds of fashion and show biz rival any Hollywood red carpet occasion. Usually, the theme of the exhibition inspires the guests’ designers. A handful of attendees, notably Rihannna and surprisingly Caroline Kennedy, wore Kawakubo’s artistic extreme creations. Although most Comme de Garcon collections over the years have been black, red has been an occasional alternative and some gala-goers acknowledged that. Red looked great on Katy Perry wearing Maison Margiela designed by John Galliano and Rita Ora in Marchesa. Other celebs simply opted for a motely mix of every and any trend du jour. There was good ol’ Madonna still trying hard to shock in Moschino camouflage, Kendall Jenner almost naked in a wisp of La Perla, Julianne Moore in feathered confetti Calvin Klein and Kate Hudson in a stunningly simple white gown by Stella McCartney. The absurdity of long, long trains continues. Dragging yards and yards of fabric behind them were Jennifer Lopez in lovely blue chiffon by Valentino, Zendaya in Dolce & Gabbana and Priyanka Chopra in a classic trench coat trailing a ridiculous train. Ralph Lauren should know better. It is indicative of the growing interest in men’s fashion that more than a few peacocks such as Joe Jonas, Rami Malek, Wiz Khalifa and the Maxwell trio walked the gala’s red carpet. More designers than ever joined the ranks of familiars like Chanel and Versace. Not so surprising is the inclusion of some so-called “fast fashion” names including custom creations by H&M and Topshop. An overview of the gala guests can be seen as an accurate reflection of the current state of fashion that is now so diverse, so inclusive and democratic that every trend possible is trending. And as always there were a few trend-followers who got it oh-so wrong. The art of Rei Kawakubo, designer of Comme des Garcons. Artful examples on Rihanna, Caroline Kennedy, Julie Macklowe and Tracee Ellis Ross. Red on Rita Ora, Katy Perry, Rami Malek and Helen Lasichan. Black/White worn by Kate Hudson, Jourdan Dlunn, Halle Berry and Emmy Rossum. Feathers flying for Julianne Moore, Blake Lively, Anna Wintour and Lupita Nyong’o. No! No! Kendall Jenner, Madonna, Nicki Minaj and Janelle Monae. All aboard the trains! Zendaya, Jennifer Lopez and Priyanka Chopra. Wiz Khalifa, Joe Jonas, Frank Ocean and the Maxwell trio. Paper Doll Studio is the colorful quarterly magazine of OPDAG (Original Paper Doll Artist's Guild." As one of the contributing editors, I am delighted to work with brilliant publisher Jenny Taliadoros and for each issue I write an article and create a new paper doll for the collector's and artists who subscribe. The current issue, No. 117, features my view of far, far-out creations by Japanese designer Rei Kawabubo plus a paper doll of the designer herself. 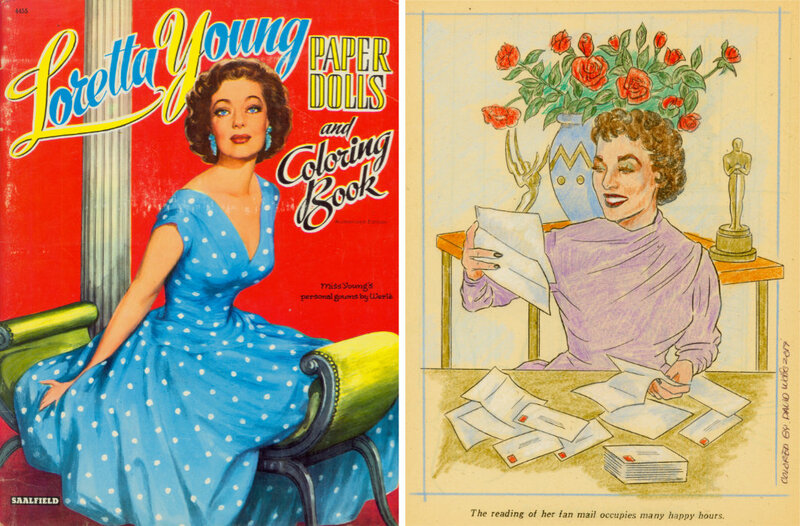 I also occasionally work with Marilyn Henry's magazine, PaperdollReview, another popular quarterly publication filled with stories devoted to vintage paper dolls, Hollywood stars and profiles of artists. Both magazines are lively, entertaining and an absolute must for paper doll enthusiasts and can be ordered from paperdollreview.com. 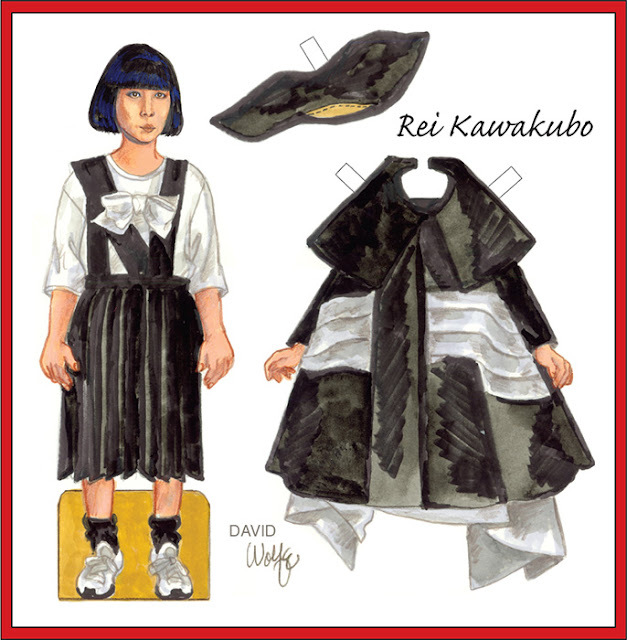 Rei Kawakubo paper doll to accompany my article in Issue 117 of the Paper Doll Studio magazine. Researching the Royal wardrobe of Queen Elizabeth II is fascinating as I prepare to begin working on a new paper doll book. During her long reign, Her Majesty has never been a fashion follower, but rather a dutiful dresser, always appropriately outfitted for her very special lifestyle. It has been said that she doesn’t care about fashion but is very particular about how she looks. The Queen dresses for the occasion, usually a rather dreary ribbon-cutting or plaque unveiling. For such daily duties, a dressy coat and a somewhat frivolous hat will do, but some times call for iconic grandeur. Elizabeth’s coronation in 1953 was one such occasion, a once-in-a-lifetime commission and designer Norman Hartnell understood that. He created a gown that bespoke the symbolic power and privilege of the Monarch. 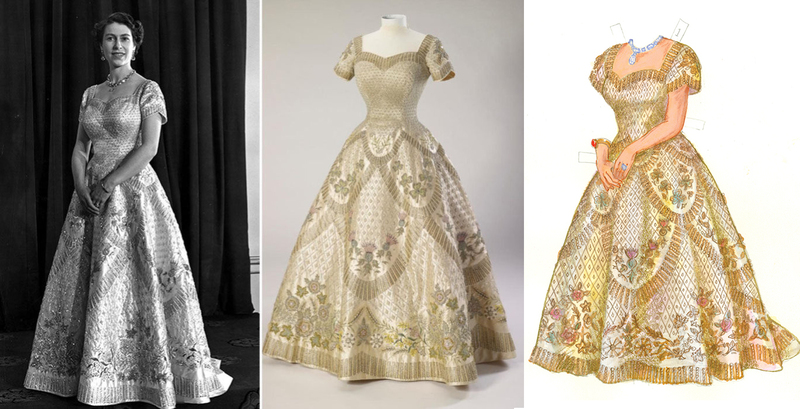 The gown suggested the full-skirted ball gowns that Christian Dior had brought back into fashion with his “New Look” of 1947. The Queen’s bodice was somewhat matronly with its conservative sweetheart neckline. The white satin gown is covered with embroidered motifs that represent the Empire; shamrocks for Ireland, thistles for Scotland, etc. A complicated, extravagant gown that was a challenge for me as an artist. It demanded patience as I poured over old photographs and current museum records. 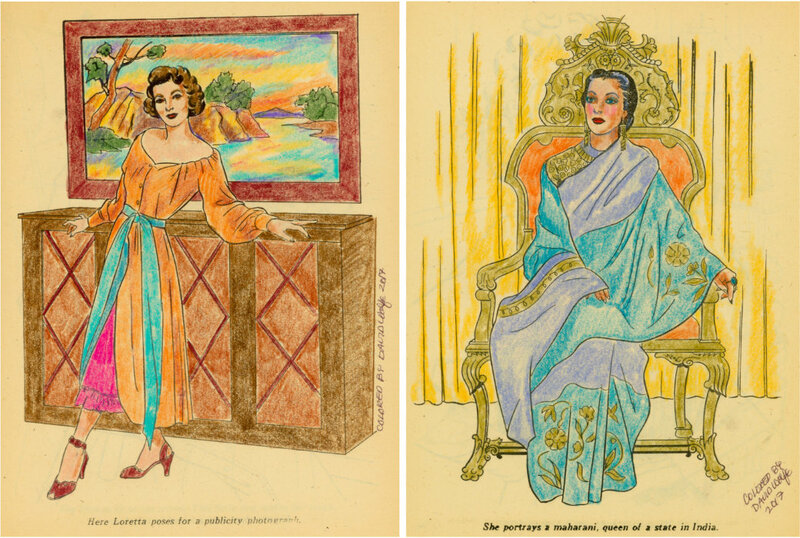 It is just one sample paper doll version of the Queen’s lifetime of her unique personal style. The book, a major undertaking, will probably be published by Paper Studio Press early next year. Her Majesty in the gown, in a museum, for my paper doll of the Queen. 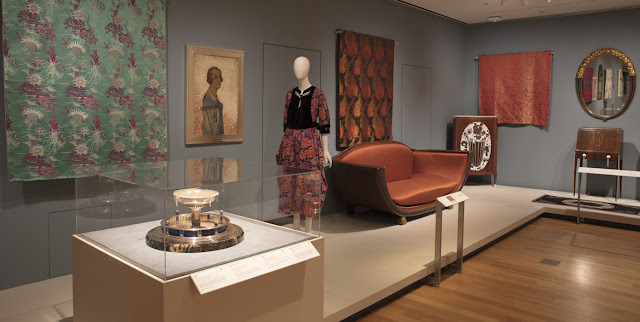 New York’s Cooper-Hewitt Museum current exhibition revisits the “The Jazz Age: American Style in the 1920s,” arguably the most important decade of the twentieth century as far as design is concerned. More than 400 examples evidence the importance of the 1920s in terms of explosive creativity. Diverse areas are represented, including interior and industrial design, decorative art, architecture, diversity and dynamism. Fashion’s disruptive modern designs spotlight Art Deco jewelry and apparel by Chanel and Fortuny. Although the period has been revived as a fashion influence, time and again, this significant exhibit may well inspire designers to reboot The Jazz Age. The exhibition ends August 20, 2017. The Jazz Age at the Cooper-Hewitt Museum in New York City. Art Deco modern design motifs. Roaring 20s fashion (Chanel on left). Jazzy accessories, compact and vanity case. The most fashion-conscious musical on Broadway now is “War Paint,” a tale of two catty competitors in the beauty biz. 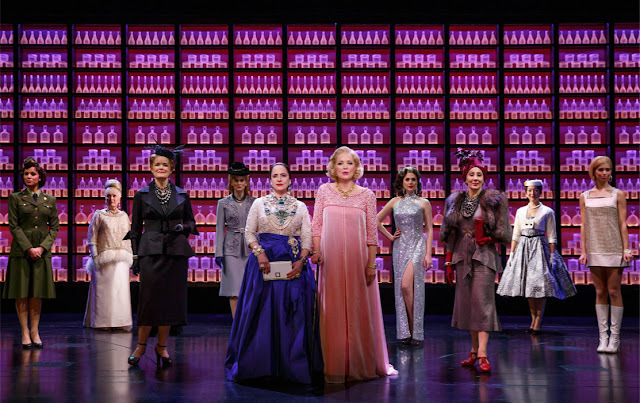 Helena Rubinstein is played by Patti Lupone while Kristine Ebersole portrays Elizabeth Arden. Double diva dynamite, to be sure! The production is a chic, slick glamorous portrait of the rival cosmetic tycoons who achieved wealth and fame, feuding for decades. They never met although the show allows a face-to-face rendez-vous for a crowd-pleasing finale. Variety’s review of the beautiful two-star vehicle said,“… it really is hard to concentrate on the plot when Ebersole is swanning around in a gorgeous rose-petal-pink silk suit. Or when Lupone steps out in a billowing taffeta number dripping with thick strands of faux gems. Luckily, there’s not much plot to distract from these carefully nuanced characters, their amazing careers and dazzling wardrobes.” The costumes by Catherine Zuber are sensational and almost do the impossible by upstaging the stars. Lupone’s accessories as the legendary, bejeweled Rubinstein could very well inspire jewelry designers and milliners while Ebersole sings an ode to Arden’s signature shade of pink. 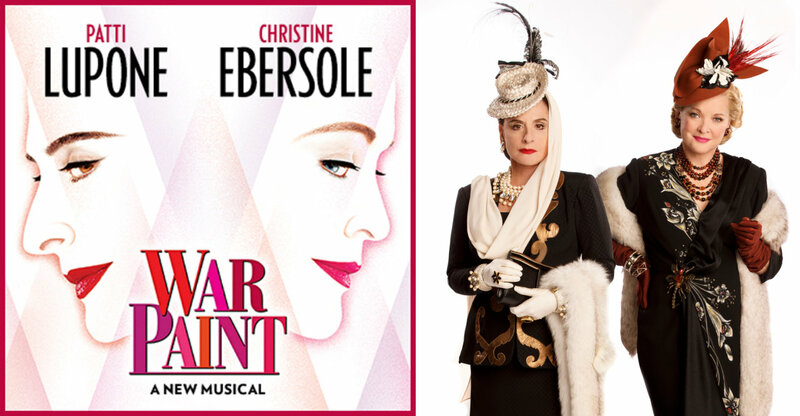 “War Paint” is playing at the Nederlander Theatre. Tickets: war.paint.nyc.com/box-office. For a glimpse of the show, visit YouTube. War Paint’s stars dressed to the hilt. 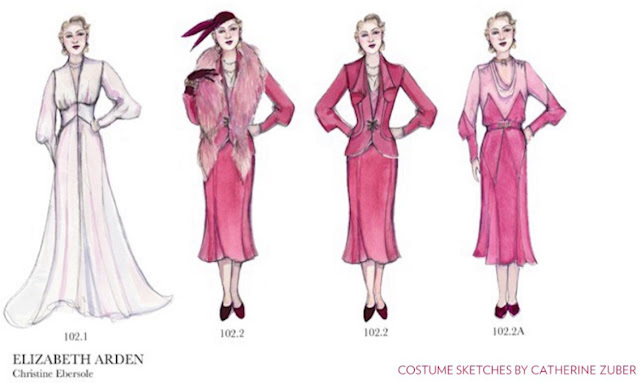 Elizabeth Arden’s costumes in pinks by Catherine Zuber. Curtain for Broadway’s glamorous star divas. Before I rediscovered paper dolls, met the dynamic Jenny Taliadoros and scores of paper doll enthusiasts, I designed outfits for Gene dolls, miniature couture creations made by my then partner, Jerrold Thomas. I used to attend the conventions for collectors of fashionable Gene, the lovely creation of genius illustrator, Mel Odom. While rummaging through some almost forgotten artwork recently, I came across this 3-page 2000 Gene convention souvenir. I don’t even remember creating it, but I guess I was preparing to discover the wonderful world of paper dolls, and I am so happy that I did! Paper doll of Gene doll with a “Luau” outfit, "Bon Voyage,” and "4th of July." Loretta Young in a sari and glamour pose. Visit the new Paperdollywood.com... and SAVE 30%! After more than a year in the works, my paperdollywood.com website has had a much-needed facelift. Here, you’ll find articles, star bios, archive paper dolls and my own memoirs. And you can shop! My own line of paper doll books can be purchased along with other books containing my star bios, as well as magazine issues that include my articles. To celebrate, I’m offering a 30% discount on orders placed by June 30, 2017. Use the discount code DAZZLE. A huge thank-you to Jenny Taliadoros for doing this website makeover. This a new format, so if you discover any glitches or errors, please contact Jenny via email or phone 800-290-2928. Hope you’ll visit paperdollywood.com! My newly redesigned paperdollywood.com website!